But if you have still decided to do it yourself, our Ranebrook Windows team would like to explain what you need to know if you’re going to fit your own windows and doors. Measurements – they’re key. Windows and doors in the UK are made to order from the measurements that the surveyor provides. If you’re doing it yourself, it’s on you to get those measurements right, get it wrong and you could face a world of pain. As a general rule, you need to measure the opening and deduct or add to it, depending on the window type. (Read our previous blogs to find out more how to measure your windows). Our surveyors have decades of experience but even then, mistakes are always possible. Not only do our survey teams double and triple check everything they do, but our installers also measure the new window against the old, when they get to the site. This is a great tip because once you rip a window out, there’s no going back. By measuring and cross-referencing each window before we remove it, we can make sure that our customer’s new energy efficient windows fit. It means that on those rare occasions where a mistake has been made, our customers don’t have to live with boarded-up windows or doors, while new replacements are made. 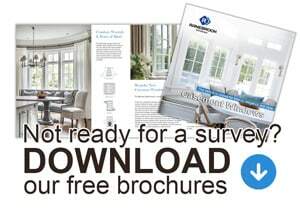 Let’s keep things positive and assume that you’ve got your measurements right, you’ve found a good supplier and your windows have been delivered on time. You now need to remove your old windows. As we have mentioned, double check sizing of new timber windows before taking out the old ones. Once you have done so, remove the opening/glass. If they’re timber frames, the easiest way to get the frames out is to cut them in the middle on each side. This sets a limit on the amount of force you apply, which makes damage to brickwork and the window surround less likely. If you’re replacing old UPVC windows, simply remove the screws and do the same. Take care, however, to avoid damage to internal plasterwork or tiling. Our fitting teams have fine-tuned the removal of windows to minimize damage. We’d recommend a light touch and pre-cutting plasterwork/SILICONE around the frame. Even then, damage can occur, so expect remedial work. Spacers are small plastic inserts used by professional window companies to help to get windows level and sitting within the right place. This is key because if the window isn’t level opening sashes won’t work properly, invalidating any guarantees and shortening the life of your new timber windows. Also, it’s important in making sure that you don’t accidentally pull the window frame out-of-square or damage it by over-tightening screws, as you fix the window to brickwork or timber. It is now law that every door installed within a home complies with British standards. If you use a reputable fitting company then a surveyor will issue you with a certificate, but if you go it alone you'll need to contact your local council and arrange a local building regulator to come and do this for you. Like everything else, if this process goes smoothly then great, but if anything goes wrong, it's always best to have a professional who is there to fix the problem for you. The biggest problem with going the DIY route is that you have no guarantee, so every time something goes wrong, you'll have to repeat the process all over again. Comparatively, using a reputable company not only gives you the best possible fit with the highest quality doors but can also offer guarantees lasting anything from 5-years to the rest of your life. So, if you shop around for the best guarantee, not only do you not have to worry about the quality of the workmanship, but you and your family will have peace of mind for many years to come. All-in-all, you're the only one who can make the decision on whether to pay extra for a company with a great reputation or to save money by doing it yourself. As with most things, replacing your timber windows and doors sounds simple enough and on a straightforward installation it can be – but take it from us, window and door installations can be anything but. Yes, you can fit your own windows – but unless you’re qualified to do so, you shouldn’t. Our fitters have got masses of experience and are true craftsmen in what they do but we can still run into challenges along the way. For more information, please don’t hesitate to email us on info@ranebrook.co.uk or call a member of our team on 01322 332237.